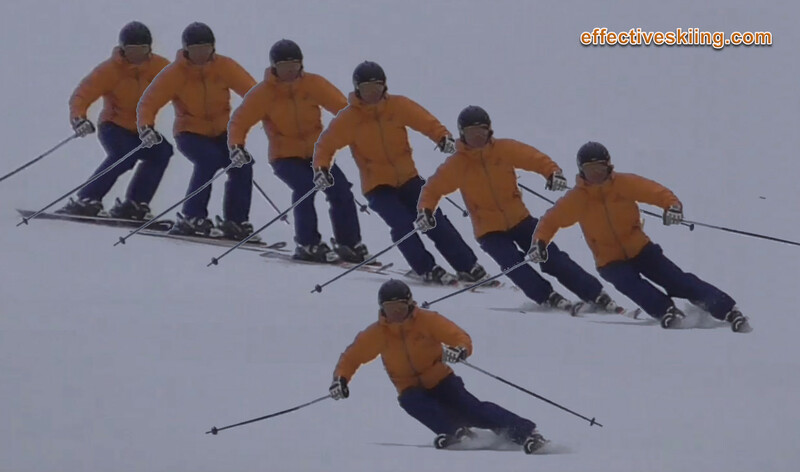 Expert skiing can be a little counter-intuitive. Expert skiers are not just "regular skiers that carve better" but they usually ski with different movements. One example is the apparent contradiction between being "low" and being "forward". This produces the appearance of the skier being back on the skis - certainly his hips and entire body are behind the boots... but are these two really contradictory? Do we have to choose between being low vs being forward? Thinking "he's back" is misleading. First of all, the skier at that point is not pressuring the skis, so there's no reason to be forward. 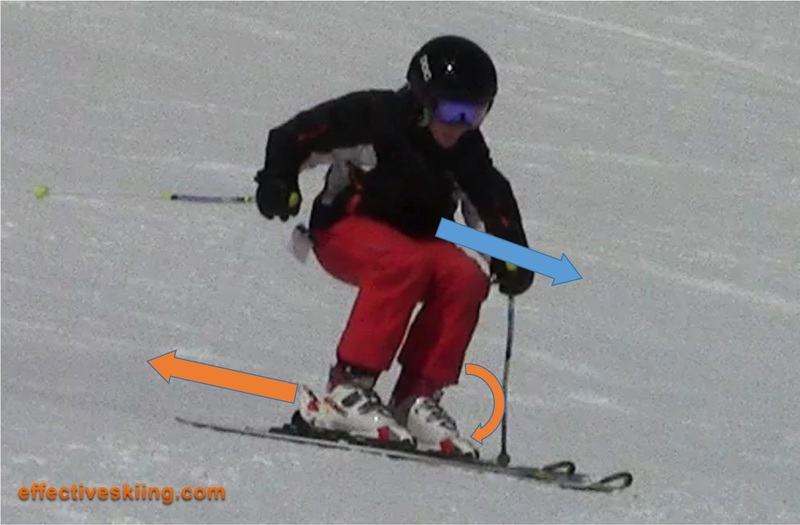 Second, strong skiers can manage separation of the skis / lower body and the upper body. 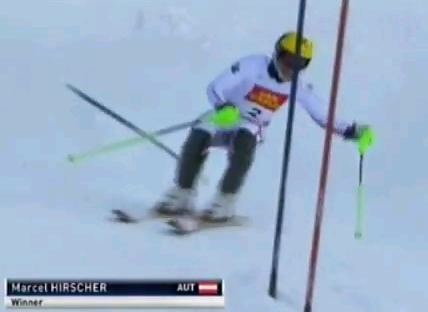 If you watch the photo above again, you will notice that his upper body is moving on a different path from his skis. This is why he will very soon be forward, just as he needs to apply pressure to the skis. Typical race coaching advice at the lower levels (say up to FIS) is to "stand up" or "push the hips forward" to be forward. The reason behind that is that most skiers cannot develop sufficient angles to send the skis to the side and sufficient separation between upper and lower body and constantly find themselves needing to get forward along the length of the skis. 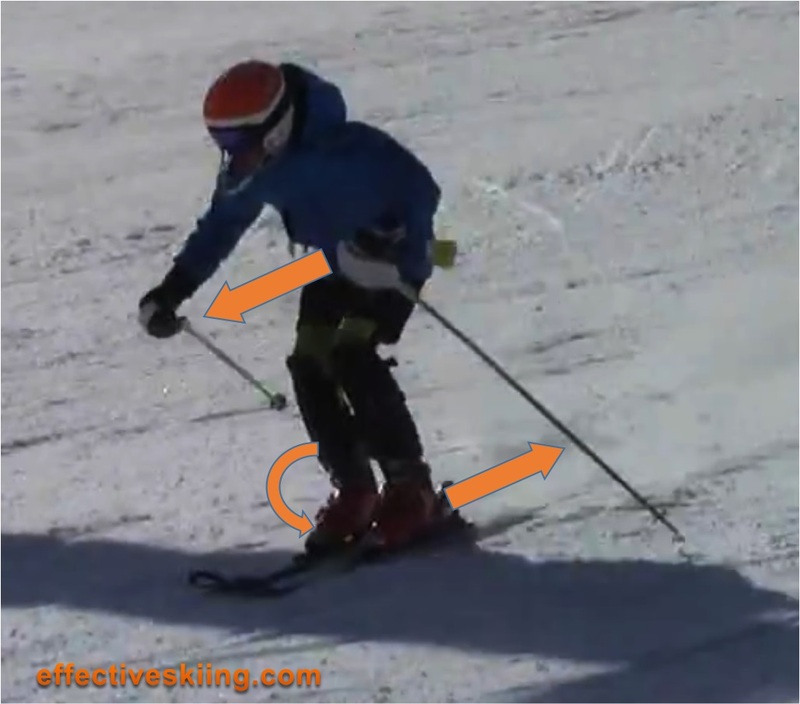 It is a good way to make skiers experiment with fore/aft movement and it's at the base of many recentering progressions... but, as skiers progress, they start to create a lot of separation, or coiling as it's referenced in racing circles and have less of a need to "stand up" to be forward. Other movements become important at this level12. For instance, in the Canadian Snow Stars skier progression, one of the priorities for the level 1 skiers is to introduce vertical movement, transforming it into lateral and forward movement towards levels 2, 3 and up. In fact, at the higher levels, extending both legs is a negative for the average turn, as it interferes with Flexed release, which becomes a major form of release, to put up with the increased energies that can be developed in these turns... tactical decisions notwithstanding. Put simply, forward is the relationship between the hips and boots2 and biomechanically, the way we put the hips in front of the boots is by having a long leg and a closed ankle - see Dorsiflexion and plantarflexion - this is why the general confusion and relationship between "tall" and "forward". It is often a challenge to recognize the 3 dimensional nature of expert skiing and we have to use many points of view (from the side) and to look at other cues to gauge how forward these racers are: shovel engagement, snappiness of turn, bending the front of the ski, snow spray etc. This is complicated further by the possibility of leveraging the boot cuff to add pressure to the front of the ski1. Don't just start flexing and sitting down between turns - flexing properly, if not taught part of a strict progression, must be added to one's skiing carefully, within a set of complementary movements... or you may indeed end up well back on the skis! Viewed 1440 times ( | Print ) this page.